Your toe is out of shape. It is called a hammer toe. The first joint of your toe sticks out. It usually makes finding comfortable shoes difficult. The top of your toe may be red and sore. Your toe will be straightened. This is done by removing the joint of the toe. 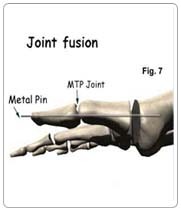 This is either called fusion of the toe, or arthrodesis. A cut is made over the top of your abnormal joint. The surfaces of the joint are then removed. The toe may be held in its correct position with a stout wire. This is known as a K-wire. This passes down from the end of the toe and across the joint to be fused. The skin is then closed up with stitches. After your operation, you will not be able to bend the toe joint. Most people try pads from the chemists or the chiropodists before seeing an orthopaedic surgeon. If the pads have not helped, probably the best plan is to permanently straighten your toe. Your toe may be painful. You will be given injections or tablets to control this. Ask for more if the gets worse. A general anaesthetic will make you slow, clumsy and forgetful for about 24 hours. The nurses will help you with everything you need until you are able to do things for yourself. Do not make important decisions during this time. You will be able to walk around with the help of crutches. The wound will have simple adhesive dressings over it. Your stitches will be taken out about two weeks after your operation. About 1 cm (less than half an inch) of the wire is left sticking out of the end of your toe. This is so it can be removed in the clinic six weeks or so after your operation. You do not need an anaesthetic to have your wire removed. Surprisingly this does not hurt. Wash around the dressing for the first 10 days. You can wash the wound area as soon as the dressing has been removed. Soap and warm tap water are entirely adequate. Salted water is not necessary. You can shower or take a bath as often as you like. You will be given an appointment to visit the orthopaedic outpatient department two weeks or so after your operation. The nurses will advise about sick notes, certificates etc. When you go home, you will be able to move around the house and manage stairs. You will not be able to go shopping for the first few weeks after you go home. Please make arrangements for friends or family to shop for you. Your toe will continue to improve for at least six months. You must not drive until your toe is completely comfortable. You are unlikely to drive for at least four weeks after your operation. How soon you can return to work depends on your job. If you can get to work without driving yourself or by using public transport you may be able to return to work six weeks after your operation. You should not do manual work until your toe is solidly fused. The wound or the wire can become infected. You will be given antibiotics to try and prevent this. If the wire becomes infected, it will be removed. There is more than a 90% chance that the toe fusion operation will be successful. However, there is always a chance that the bones may not fuse. If this occurs, a further operation may be necessary.